The internet has become a huge platform for all things business. The typical internet user can now do anything from shop for some clothes to going grocery shopping without ever having to leave the house. As a result, many businesses have begun to shift gears so as to provide more conveniences for their target consumers. From creating ecommerce websites to providing high quality products and services, businesses are going above and beyond to get the word out about what they have to offer. The only problem is, with businesses being able to establish an online presence so quickly, there are literally thousands of options for consumers to choose from. So how does someone just starting out in the world of digital business, with a small budget for marketing, stand out from the competition? How do you make your company a household name that gets repeat business and continues to succeed year after year? It all boils down to branding…Branding, in business lingo essentially means making a name for yourself. Setting yourself apart from the others. It’s about developing the type of credibility that gives your target audience the reassurance that your company is THE Company to work with. 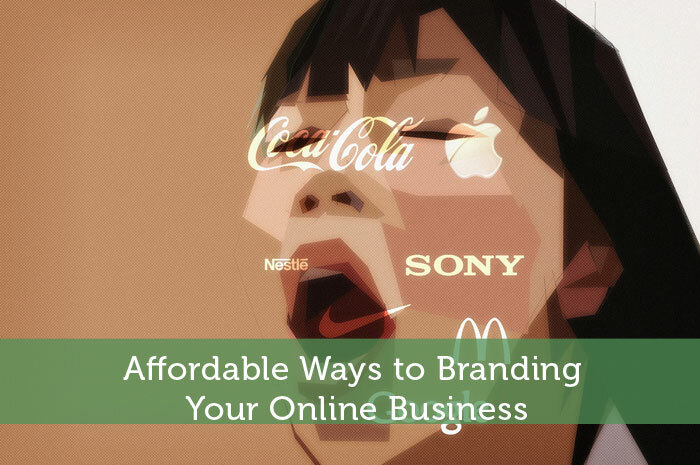 Branding is most certainly a large aspect of marketing, and fortunately it doesn’t have to cost much at all. Here are some suggestions on how to make a name for your business with little to no money for marketing. 1. Create a User Friendly Website – part of your brand reputation is making sure that your customers have the best experience possible when shopping through your site. Creating a website that is not only attractive to look at, but easy to use for consumers is of extreme importance. You want your customers to be able to easily find the products (or services) they’re looking for, and make the purchase without any hassle. Anyone who visits website wants an easy experience. Too many complications could result in a ruined experience, which equals a diminished reputation, and essentially a tarnished brand. 2. Create Company Social Media Accounts – social media is increasingly in popularity when it comes to conducting business. What’s also great about this form of marketing and branding is that it is absolutely free to create these accounts. Using various social media platforms such as Facebook, Twitter, Google +, or LinkedIn can help you in reaching a plethora of consumers that you wouldn’t be able to reach from simply having a company website. It also allows you to connect with your audience, learn what their needs are, and fine tune your products or services to meet their needs more accordingly. 3. Promotional Giveaways – What better way to spread the word about your online business than to provide interested parties with discounted or free products and services? It allows the consumer to affordably learn more about what your company has to offer, and also gives them a reason to pass the word along. Promotional giveaways don’t have to mean providing them with a free high priced item or service; it can be something affordable to you as well. For instance, offering a 15% discount on a popular product for a 24 hour period can get customers interested in purchasing what you have to offer. What’s more is that because the offer is for a limited time, they are more inclined to purchase and pass it along to others they know that would love to take advantage of the deal as well. 4. Quality Packaging – If your online business requires the shipment of merchandise to your customers, then investing in quality packaging can go a long way in building a name for your brand. Custom Boxes Now points out the various reasons that utilizing plain packaging to ship your merchandise could be selling your products short. Not only do custom boxes provide a look of professionalism, but they also allow for easy placement of your company name, logo, and colors to make a lasting first impression on your customers. The great thing about the internet and online marketing and branding is that a lot of the most effective methods are free of charge or easily affordable. When branding your business and developing an online presence it is important to utilize various platforms and resources to reach your target audience. By creating an effective, user-friendly website, creating quality social media accounts (active accounts where you’re frequently socializing), providing promotional giveaways, and using quality packing, you are sure to leave a lasting impression on the minds of many.